Roofing Astadiom Singapore National largest dome in the world Archi-new - Free Dwg file Blocks Cad autocad architecture. Archi-new 3D Dwg - Free Dwg file Blocks Cad autocad architecture. 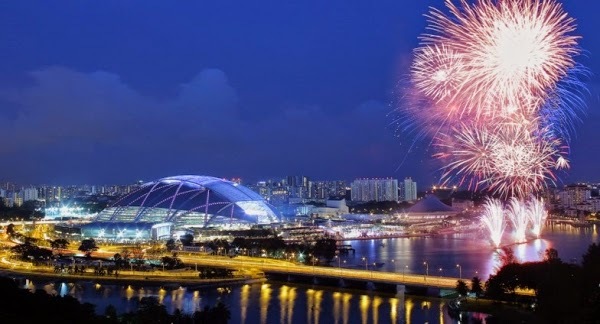 The Singapore National Roofing Astadiom the new owner of the largest metaphor Qbouap without poles in the world; the opening of the dome 310 meters, as the roof can be opened and closed in proportion to the tropical climate. Cooperation on the design and Alastadiom huge sports complex Singapore Sports Hub team of engineers and designers including Arup Arup and DB Arkittikedz DP Architects and AECOM and extends the complex on an area of 35 hectares on the waterfront in the Kallang area southeast of Singapore. Sports complex includes Singapore Sports Hub create huge dome where the national Alastadiom along with the rest of the buildings, which includes internal Astadiom and water sports center and a museum. The Alastadiom has won the title of the Sports building at the World Architecture Festival, which expands to 55 thousand people can sit under the nail of the central curved roof with the 310 meters. According to the project architect Clive Lewis Clive Lewis "is a ceiling domes form architecturally and structurally very iconic." In response to the tropical climate of the panels can be embedded within the roof to slide to open or closes garrison pitch of heavy rain, or in order to keep the space cool during high temperatures. According to the team, while the roof is opened is not used Alastadiom which helps the growth of grass in good conditions. Manufacturing has been the moving parts of the roof of the ETFE plastic and chosen as a building material for the thermal advantages and strength. The support of these panels Bmhdat metal bending Qosja the field, and connected to the metal frame that covers the gaps on either side of Alastadiom. Is pumped air conditioning in the construction down the ranks of red plastic seats that fill the stands. Covering the light skin of sheet metal steel frame, weighing up to about 8,000 tons, which is a relatively simple block in the world of giant enterprises. "We wanted for the national Astadiom cover reflect the shape and geometry of origin bottom and this is what we have achieved through extreme lightness coverage system." Lewis added. A network of curved metal arches over the outside of the dome also intersect, while the integration of HID lighting within the metal work for lighting Alastadiom night. The ends of the earth in front of symptoms contact interfaces, creating a double-layered framework for the establishment of a corridor Ocean Balastadiom.